As hard as it is to believe, it has been 20 years since Diana, Princess of Wales, was tragically killed in a car accident in Paris on August 31, 1997. Her untimely death at the age of 36 stunned Britain and the world. Over the years, Diana, who was known as the Queen of Hearts, transformed from an unknown and timid teenager to a fashion and jewelry icon. She burst onto the global scene at the age of 19 in a fairytale wedding, televised live worldwide and watch by some 750 million people from 74 countries. Prior to her marriage to Prince Charles in 1981 and in the first few years that followed, Diana’s personal style comprised simple, old-fashioned English-style clothes. As she matured, she became a fashionable woman, courted by every prominent designer in the world. Over the years, she became famous for flawlessly pairing modern gowns with the Crown Jewels, making the historical jewelry modern and contemporary. Befitting her royal status, Diana donned a wide range of jewelry, including diamond studded tiaras, diamond and pearl earrings, bracelets, necklaces, brooches and watches. Some of the jewelry was owned by the Spenser family, some were designed by top designers such as the House of Garrard – the royal family’s jewelers since 1843 – and some were given to her as gifts by heads of state, such as the emir of Qatar and the sultan of Oman, as well as by the British royal family. Over the years, some of the jewelry has become synonymous with Princess Diana. The one piece of jewelry most synonymous with the late princess is, without a doubt, her engagement ring, whose design is now named for her. The ring was designed by the House of Garrard and offered to Diana as part of a selection of engagement rings to choose from. 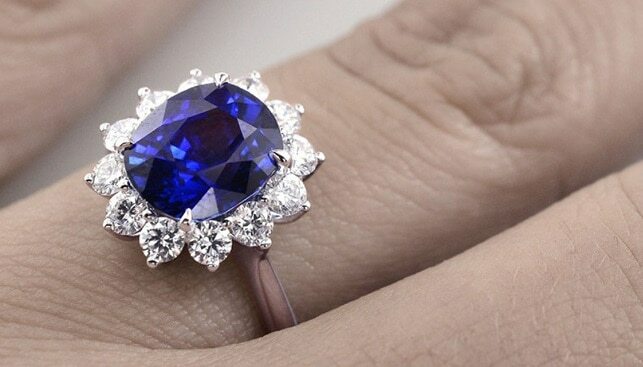 The ring comprises 14 solitaire diamonds surrounding a 12-carat oval blue Ceylon sapphire, set in 18-carat white gold. After her tragic death, her son William inherited the ring and gave it to his wife, Catherine Middleton, Duchess of Cambridge. Since the ring debuted in 1981, the design has been duplicated thousands of times. The Spencer Tiara, which Diana wore at her wedding, was a family heirloom and not part of the Crown Jewels. The tiara was designed for the Spencer family in 1937, based on a brooch the family owned. It includes diamonds in silver settings mounted in gold in various floral shapes. While Diana did not own the tiara, she wore it very often, making it synonymous with her style. Princess Diana loved pearls and one of her favorite pieces was an oval sapphire surrounded by two rows of diamonds, set in a seven-strand pearl choker. Originally a brooch, the sapphire was given to Diana by the Queen Mother as a wedding present, and she had it set at the heart of a choker. One of the most high-profile events where Diana wore the choker was during a 1985 visit to the White House, during which she famously danced with actor John Travolta. 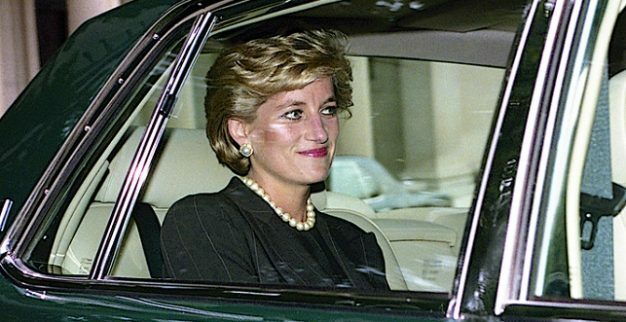 Ten years after Diana’s death, investigators determined the Paris car accident in which she was killed was the result of her driver being drunk and the high-speed pursuit of their car by dozens of paparazzi. Much like her wedding, Diana’s funeral service was one of the most watched televised events in history, as over 2 billion people worldwide tuned in to see it. The royal family chose to mark the 20th anniversary of Diana’s tragic death with a series of events throughout 2017. One of those was “Diana: Her Fashion Story,” which opened in February at Kensington Palace and traces the evolution of Diana’s style, from demure and romantic to elegant and confident, via a series of iconic outfits worn by the princess, who met an untimely death.